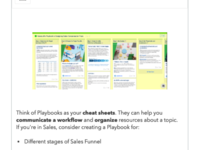 Kiite Playbooks helps sales teams capture, organize, and share their documented and tribal knowledge. 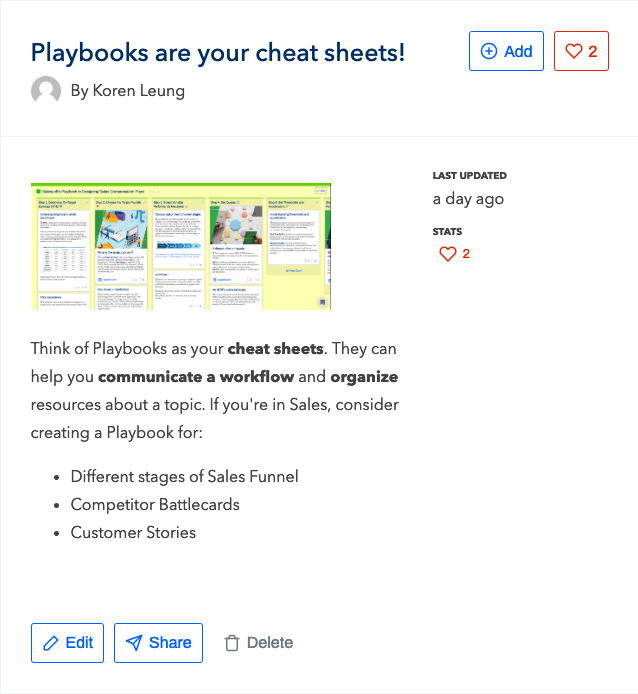 Kiite helps sales teams capture, organize, and share their documented and tribal knowledge. 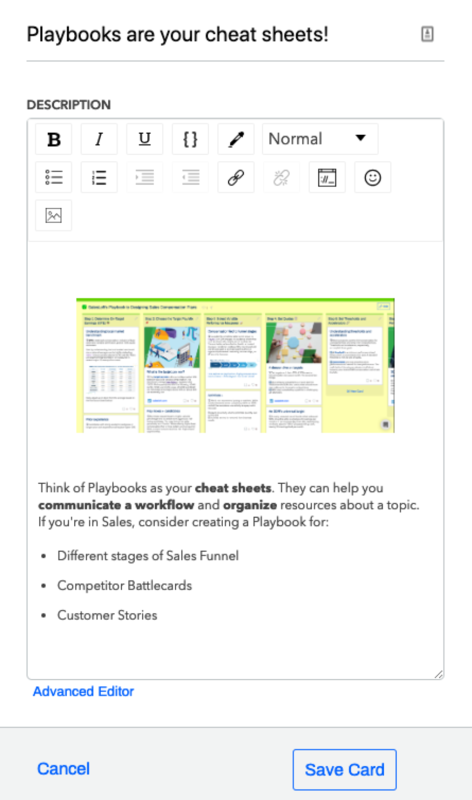 Sales leaders and sales reps use the web app to organize their information cards by creating cards, and remixing them into customized playbooks. Card content isn't limited to institutional knowledge; cards can be user-generated, automatically generated from chat dialogue and questions, or crowdsourced from subject matter experts on-demand. 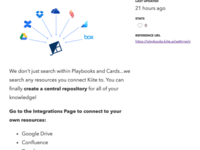 Kiite is an easier, faster and sleeker way to access/upload content than your standard repository. Pros: Working with sales reps has truly made me understand the saying "less is more". With so much information coming from everywhere, it was hard for me as sales enablement to break through the noise, just as it was hard for the sales reps to know what info was important and where to find it. With Kiite, the snippet functionality made it easy and fast for the reps to get information they were looking for, without overwhelming them with text that previous tools were doing. 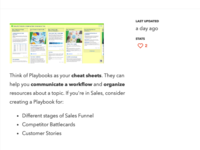 Cons: One area of Kiite that our team would love to see in the future is to dive a level deeper into a playbook, so that one would be able to go into a playbook, see all the different columns and click into one specific column. This would allow for those cards under this column to be completely isolated from the other topics, and would allow reps to be more specific with their search. Overall: Overall amazing experience with both the tool and the team of Kiite! My role under Sales Enablement is to provide materials in way that is easy for them to access and refer to later. As of right now, the repository system we are using is very text heavy and the layout makes finding content so difficult that the reps often give up and ask each other directly. 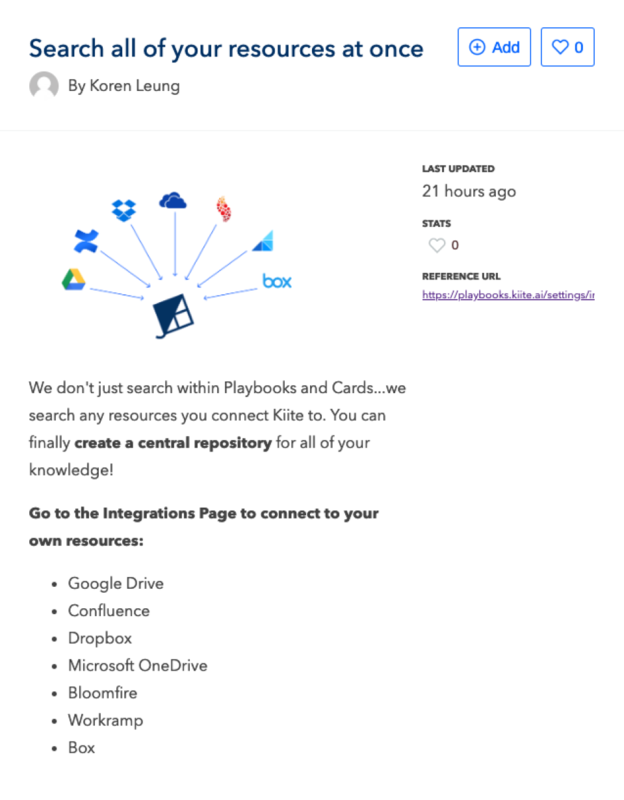 The way that Kiite displays information, and having the ability for playbooks and cards to live in multiple locations solves this problem and allows reps to find content fast and with ease. With this layout reps are able to benefit as they can find more accurate information in a centralized location to help them close deals. Pros: The ease of use. Everything I need is available for my reps and I. My reps feel confident and creative in making their playbooks, but still adhere to the guidelines I set out for them. It's self-service and everyone has autonomy to grab cards and make their awesome cheat sheets. Cons: I think they have some features they need to build out still. I'm not overly concerned about that though at this moment. Overall: Ensuring reps have access to info at the right time and have control over what they need when. This was a big problem prior when having info stored in multiple areas, whereas now we have a one stop shop for everything! Pros: The creation of content is easy, it updates automatically if you update the source. Cons: NLP can sometimes get it wrong. So you have to ask the question in a specific way to get the right answer. There is a new search functionality coming up that might fix this. 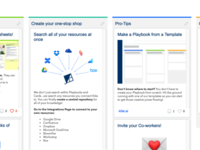 Overall: I had a great experience not just with the product, but with the onboarding. The Kiite team is responsive, dependable and generally awesome.